I’m delighted to be reinstating this feature as a monthly special on my blog. I love having the opportunity to talk with talented, creative people who are making a go of it in this very competitive field. It’s a wonderful opportunity to learn – about what works and what doesn’t, what the particular challenges and rewards are, what is hard and what comes easy, and how different people go about accomplishing their work. These interviews will usually take place on either the third Saturday or the third Sunday of the month (I haven’t decided yet :)), but since January started on a Sunday and there’s so much going on as the new year kicks off, I bent the rules by a week. Then, due to the squirrelly internet out here in the boondocks, the art for the post didn’t come through in time, so I couldn’t post yesterday. So here it is today instead, bumping Oh, Susanna into next week. Such is the way of things sometimes 🙂 But well worth it for today’s interview! 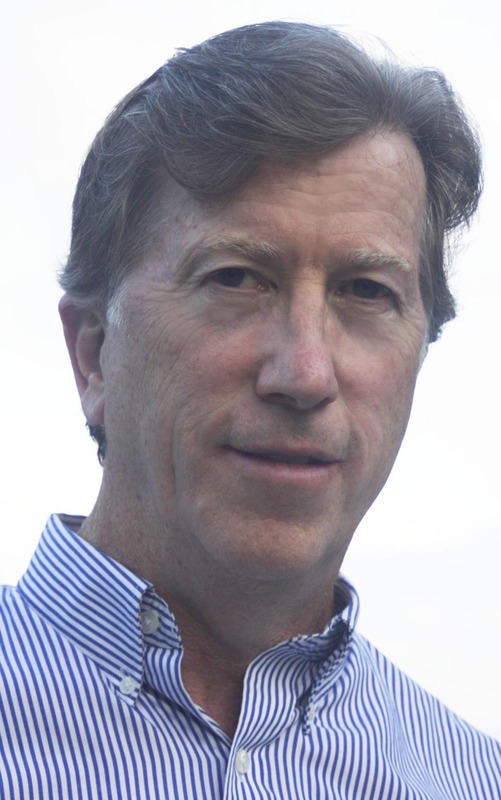 It is my very great pleasure to present this month’s Author/Illustrator, Michael Garland! Traditional or Digital Format? All books so far started in traditional format, but some have been converted to digital. Apps or Not? 3 apps: Icarus Swinebuckle, Henry’s Parade, and Angel Cat. Day, Afternoon or Night Worker? 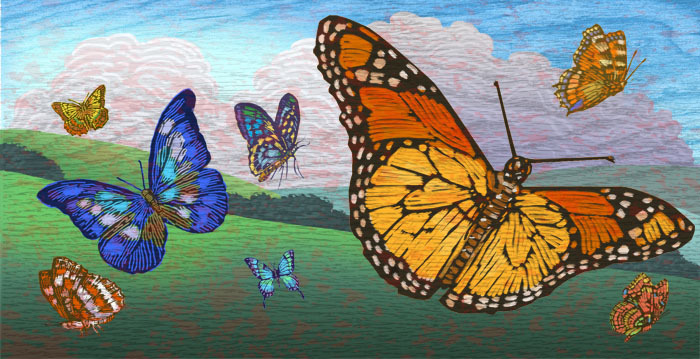 Writing – brain freshest in AM; drawing – second nature and can do any time. Quiet or Music? Writing – complete silence; painting/drawing – any noise is fine but usually choose CNN, the Golf Channel or the History Channel. SLH: Now for the more involved stuff! When did you first become interested in writing/illustrating? MG: I began drawing as a very young child. I drew to entertain myself. I even made little books, although I didn’t really think of them that way at the time. My parents were lavish with their praise and encouraged me. When I reached Kindergarten, the teacher was equally enthusiastic about my work. It was quickly and readily apparent that I could draw better than the other kids. My teachers would hold up everything I drew to show the other students… which was never true of my math tests 🙂 I went to a Catholic boys high school where there was no real art curriculum. But afterwards I attended the Pratt Institute. SLH: So illustrating really came first for you. When did you begin writing as well? MG: It was a leap for me to finally write a story myself. I had always thought of myself as an illustrator, not a writer. But after I had illustrated a number of books for other people, I began to think how much fun it would be to tell my own stories. The first book that I both wrote and illustrated was called My Cousin Katie and was based on my own daughter. Having written about one child, I wanted to wrote about the others, so My Cousin Katie was followed by Circus Girl and Dinner At Magritte’s for my other children. These three titles remain among my favorites, along with Leah’s Pony, the house for which was modeled on a house near me even though it takes place in Texas; The Legend Of Sleepy Hollow, which has remained in print for a long time; Santa Kid, which I illustrated for James Patterson; and The Magically Mysterious Adventures of Noelle The Bulldog and Noelle’s Treaure Tale which I illustrated for Gloria Estefan. SLH: How many books have you published? MG: I have published about 40 books that I illustrated but didn’t write, and about 30 where I did both. SLH: Wow! That is impressive! Have you ever written anything that didn’t sell? MG: Oh, sure! I have about 5 or 6 projects that don’t sell for every one that does. SLH: You’re ahead of the curve, then 🙂 Most people say they have 10 unsold mss for every one that sells! Do you consider yourself an author or an illustrator first, or are the two inseparable? MG: As I mentioned, I originally thought of myself as an illustrator. But now the two are really inseparable. SLH: You were really a pioneer in digital art – one of the first to use that medium. Can you tell us a little about that? MG: The first time I used digital art was for The Mouse Before Christmas which was published in 1997. It was hard to get folks to accept back then, but interestingly enough, it was an older editor – in her seventies – who was willing to give it a try. Editors quickly saw how much easier it was to work with digital art. Changes that were time-consuming and difficult to pull off with traditional painting could often be fixed in matter of minutes in the digital format. The equipment was expensive, and the disks were huge, cost about $60 each, and could only hold about 2 paintings each, so I would hand over a stack of disks for a single book, which I then, usually didn’t get back to reuse. But it turned out to be worth it! SLH: This leads into your new book – Fish Had A Wish – due out from Holiday House in February 2012 – just a couple weeks away. You have pioneered another new art form with this. Can you tell us about the book and the new art? MG: Fish Had A Wish (originally titled Fish Wishing, then Fish Wish, and finally Fish Had A Wish) was inspired because I love nature books and I wanted to write one. So I started out with a fish. He is bored of being a fish and imagines what it would be like if he could be something else. It is intended for earliest readers and as such has a very short and simple text. It was short and simple to begin with, and the editor cut it by about 1/3 again. The new art you’re referring to is what I like to call digi-woodcut. 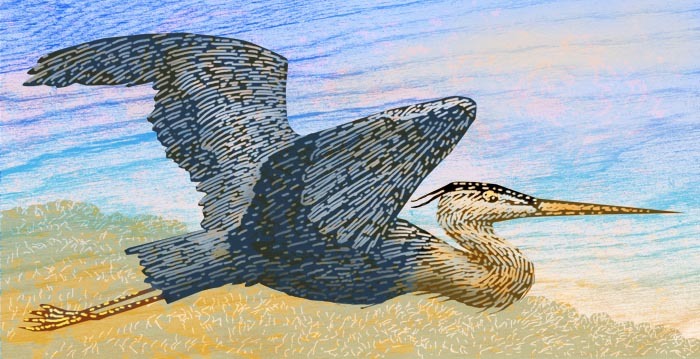 It’s a form of digital art that mimics woodcut. I scan in all kinds of wood textures and then layer them in the painting. Aren’t they gorgeous?! Which brings me to the importance of art in picture books… As both an author and an illustrator, what are your thoughts on the importance of writing vs. the importance of art? MG: A picture book is supposed to be 50/50. The author, or the writing, tells half the story and the illustrations tell the other half. It should be equal. A good picture book is. But in terms of how it’s perceived, in my experience, in the publishing equation authors get a disproportionate amount of the credit. SLH: A few of your books have become apps – Icarus Swinebuckle, Henry’s Parade, and Angel Cat. What has your experience been like in this venue? MG: It’s been fun to see the books developed into apps. When Icarus Swinebuckle came out, it was on the itunes bestseller list for 2 weeks and was #1 in Jamaica! But then you get into the problem of the infinite bookshelf. New apps are coming in all the time. When books are available in a library, they’re right there on the shelf. You can see everything there is to choose from. It might not be the most extensive choice, and you might not notice everything that’s there, but it’s finite. When apps go out, they become part of the infinite bookshelf. Publishers are taking all their backlisted books and digitizing them. EVERYthing is available. So how do you even know what’s out there? How do you find things? As an author or illustrator, how do you get people’s attention? This is one of the challenges facing us as we move forward. SLH: Do you have any advice for aspiring authors and/or illustrators? MG: Don’t allow one rejection to discourage you. Or even a bunch. And it has to be enjoyable. If you’re not having fun, you shouldn’t be doing it. I have been 38 years in the business. I’ve made the New York Times bestseller list 4 times – with Miss Smith And The Haunted Library, Santa Kid, The Magically Mysterious Adventures Of Noelle The Bulldog, and Noelle’s Treasure Tale. But what I consider to be one of my real successes is that I get to do something I love. I have never had to go to a job I hated. SLH: Finally, Michael, I’d like to finish up with a question from one of our readers. She asks, is it totally important to have a story, or can you just entertain and make people think? She gives as an example a current idea which is an adventure with a lot of imaginative things, but no story per se. MG: In my opinion, story is the most important thing. The writing tells half and the pictures tell half, but if you don’t have a story, you have nothing. You need a beginning, a middle and an end; a provocative opening, something has to happen, and then it has to resolve. Story is everything. SLH: Michael, thank you so much for joining us! It’s been wonderful hearing all you have to say! 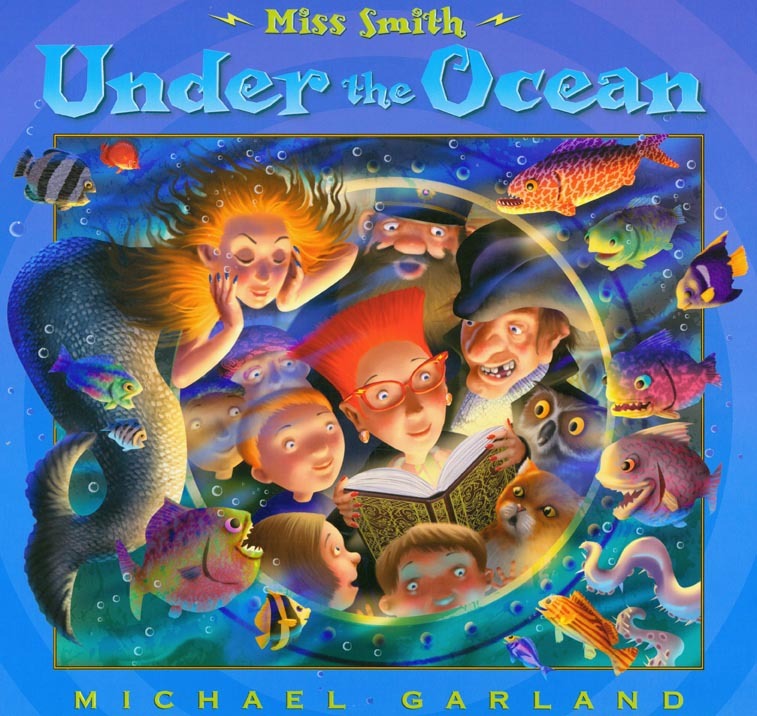 And now, my friends, just because I like you :), anyone who comments on this post by Wednesday January 25 at 11:59 PM EST will be eligible to win their choice of Icarus Swinebuckle or Miss Smith’s Incredible Storybook by Michael Garland. Michael’s book are available wherever books are sold. 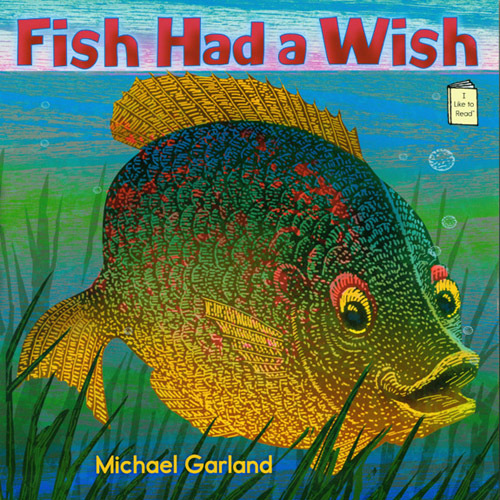 Fish Had A Wish will be out in a couple of weeks, so go ahead and pre-order 🙂 And please visit Michael at his website where you can see the breadth of his work as well as learn about his availability for school visits. 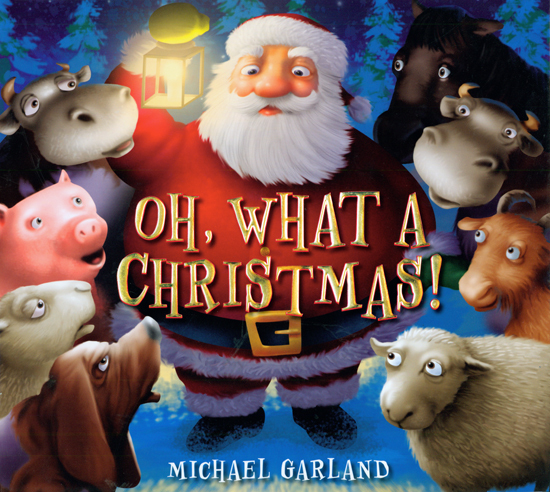 For another great interview with Michael which focuses on his 2011 holiday book Oh, What A Christmas!, please visit Pat’s blog at Children’s Books Heal. I know, aren't they amazing? Glad you liked the interview! Thanks so much for your detailed answer. Thanks again for the interview with Susanna. It was wonderful. Ha ha, you mean I may have more of a chance then? *oh good* she says happily. Great interview! Thanks for sharing Michael's thoughts with us! You're welcome! Glad if you enjoyed it! I have to get Grandpa's Tractor. I have a picture of my son when he was 2 on my Grandpa's lap on his tractor! It was so cool to see him on his lap — my wife was a little nervous as the tractor had seen better days. Some of my fondest memories of my grandparents are on their farm with the tractors and the chickens. Great interview! Enjoyed it very much! I admire individuals who are both writer and illustrator. They have an advantage over the rest of us, because they understand both sides of the equation. Wow! What with your picture, I think Grandpa's Tractor is a must 🙂 Hope you like it, and glad you enjoyed the interview! Excellent post and interview! I love Michael's illustrations. Very inspiring. I, too, am an illustrator in the early stages of writing my first story so reading this post really energized me. Okay, I am in awe. 40 illustrated and 30 illustrated and written? Not to mention the 5 to 6 that go unpublished for each published??? I am feeling duly ashamed of my writing habit. Michael is awesome, but remember, he's been at it 38 years! I'm guessing in 38 years you'll have a lot more completed and published work than you do now 🙂 And yes, I agree – story is everything! Terrific interview Susanna! It was exciting to learn how Michael's amazing stories and beautiful illustrations come to life! It was very nice meeting you Michael. Thank you for sharing your experience with us. I love your new art technique! Thanks for reading, Saba. Glad you enjoyed it. The new art is amazing, isn't it?! I'm glad you liked it, Julie. I always enjoy hearing about other authors' processes, and since I'm not an artist I always find that part especially interesting. I was impressed by Michael's prolific output. 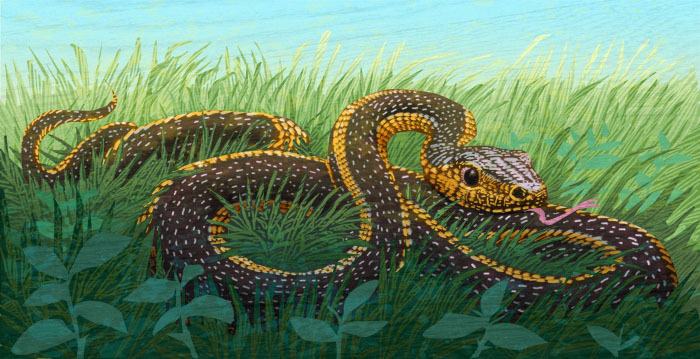 I also love the way he has used different methods as he produces different illustrations. The woodcut effects in his latest book look so good. I love his fish and the butterflies. I an imagine young children being absorbed in his school presentations. Thanks Susanna for educating us through these interviews. Thank you Mr. Garland for your detailed responses and Susannah for the great interview. I'll also have to check out Grandpa's Tractor. My Grandpa had a tractor, and I loved it. My in-laws still have a tractor, but we don't get to see them very often and they might sell the farm soon. I'm not sure my boys will be able to remember it. Thank you Mr. Garland for your detailed responses and Susanna for the great interview. I'll also have to check out Grandpa's Tractor. My Grandpa had a tractor, and I loved it. My in-laws still have a tractor, but we don't get to see them very often and they might sell the farm soon. I'm not sure my boys will be able to remember it. 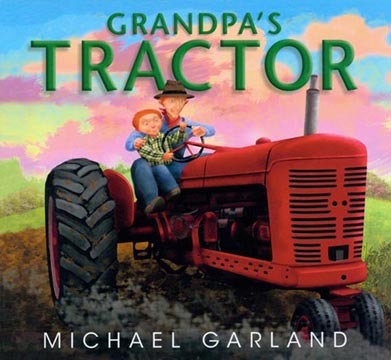 So interesting that Grandpa's Tractor is the one that grabs everyone!